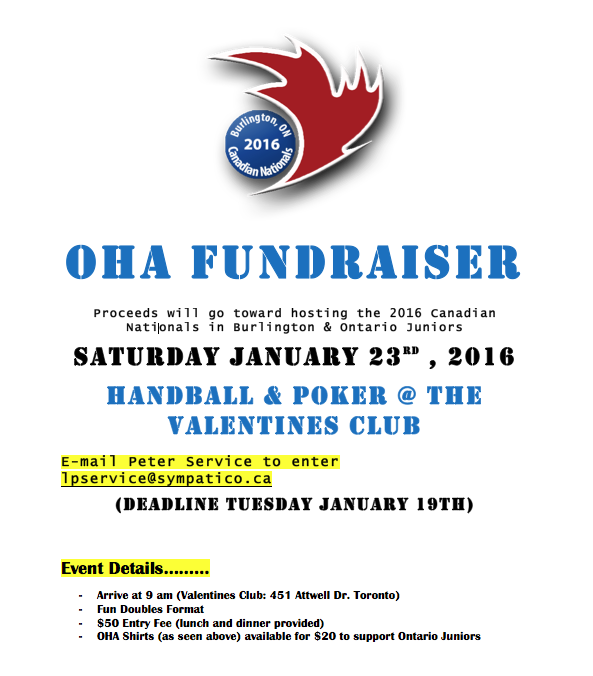 The Ontario Handball Association would like to thank everyone who attended our 2019 Junior Fundraiser on Saturday February 9th. We appreciate all of the support, through donations and participation we were able to surpass our goal!! Thank you for your ongoing generosity in supporting the growth and development of the OHA through Junior Programming. Our junior program will greatly benefit from your significant contributions. We will be purchasing additional equipment and court time throughout the province for junior clinics, events and regular programming. Thank you to everyone who came out this weekend to participate and support the Ontario Provincial Handball Championships!! Congratulations to Ivan Burgos on his Open Singles win over Ryan Bowler. And congratulations to Ryan Bowler and Jerome Santerre on their win over Ivan Burgos and Peter Service in the Open Doubles. Great matches throughout the entire tournament, so much fun to watch!! Congratulations to Dave Walker on his B Singles win over Nasim Bajwa. Wally Oprzedek and Nathan Body defeated Dave Walker and Ross wood for the A Doubles title and Alex May took the A singles victory over Adam Johnston. Sal LiPuma dominated the Senior Singles. Last but not least, Ivan Elliott and Mark Gronlund took the title for Senior Doubles. Thank you to everyone who came out to the tournament on Saturday April 14th at the Pickering Rec Complex!! Despite the horrible weather it was a fabulous day with a great group of people!! Congratulations to Nathan Body and Christopher Avalos on their win!! Also, to the runners up Ivan Burgos and Harry Keene. One last special thank you to Rhonda Gletherow, for all of her delicious treats and being such a huge supporter of Handball in Ontario!! Not only did this event showcase the courts in Pickering and demonstrate our need to keep them, but we were able to make a small profit to be spent on junior programming and clinic time at the Complex!! Thank you to all the players, friends, volunteers and supporters of the 2016 Canadian National Championships!! Hope to see all of you in Burlington May 18th-21st!! On behalf of the Ontario Handball Association, we are soliciting your support for the upcoming Canadian National Championships in Burlington Ontario (May 18th-21st, 2016). 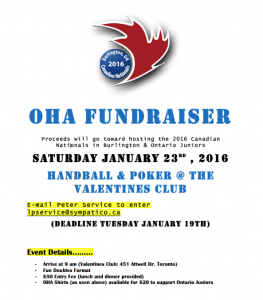 The Ontario Handball Association committee consists of volunteers that are committed to running amazing events for both adults and juniors, providing players with an opportunity to develop not only as athletes but as ambassadors of the sport. Handball promotes healthy living and activity by combining cardiovascular activity, fine motor skills and hand-eye co-ordination. With our focus being junior players and programs, Handball encourages many character values in our young athletes, such as commitment, desire, integrity, respect and sportsmanship.